This Thursday I decided to sneak off to Dripping Springs Lake for a little sunset paddling after work. The days are really getting shorter! Just a short time ago, I was leaving at 6:30pm for sunset paddling...these days it pays to leave immediately after work. Since Dianne hasn't felt like kayaking much lately... I went solo. I always discourage other folks against solo paddling, but my new digital camera arrived Thursday and i just had to get it out on the water. The camera worked quite well and allowed me to capture a shot of an Osprey hunting on Dripping Springs Lake as well as the picture on this post. Not bad for low light, handheld from onboard my kayak. It was the first Osprey I have ever seen in Okmulgee county. The truth is I killed my old one in my last solo paddling misadventure. A couple weeks ago, while Dianne was working on the lawn at our river lot, I decided to take a sunset kayak trip on the North Canadian River. Since the levels have dropped back to normal, our bit of river frontage once again offers an unpleasantly steep spot for launching a boat or even stepping into the water. The last time I paddled here I had to do a seal launch down the steep bank and i made it fine. However, on the next attempt i got to enjoy a refreshing swim. Dianne had to paddle quite a ways downstream to catch up with my boat and paddle but she eventually returned with them. My cell phone and Panasonic FZ7 digital camera found the swim to be more than they could bear. As I slid down the riverbank, I could not help but notice how much deeper the bow sunk in the river. Much more river water flowed into the boat from over the bow than the last time. I sort of spaced out on that as it was happening and when the bow finally popped up... I should knew the boat would shift rapidly and I should have braced hard with the paddle. Instead, I tipped over for a swim before paddling the first stroke! On the previous attempt, when I successfuly made the launch, I noticed water coming in over the bow and decided I should attach my spray skirt before attempting it again. Unfortunately, I didn't heed my own advice. There were many opportunities for me to screw this up less and I missed most of them. I must honestly confess that the only thing i did right was wear my PFD. river saw fit to send me a reminder. My old Panasonic FZ7 is Dead. Long live the new Panasonic Lumix FZ8 ! I also lost like a million phone numbers that were on my phone, but this is how we learn, right? TIP: Wear the PFD and use the dry containers especially at launch, landings and rapids. 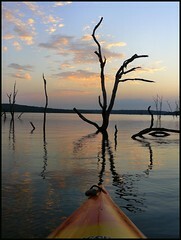 For the first hour of my paddling session at Dripping Springs Lake, I was terribly worried about killing my new camera. I expected this and working though it was one of my main intentions behind getting on the water as soon as possible with the new Lumix. After all, the camera holds little value for me, if I can't bring myself to take it on the water. That is why I buy fairly inexpensive digital cameras, I want to be able to fearlessly take the with me kayaking anywhere. Of course, when I was shopping for a replacement camera I was really excited about trying out a new brand. I had my eye on a Fuji, a Cannon or a Nikon. When I did the math, the Panasonic just offered more bang for the buck. There are not too many camera's under $250 that can shoot in at 12x Zoom in RAW format, but the Panasonic Lumix FZ8 makes it easy and affordable.